Senator Matt Huffman, R-OH, discusses project details during the opening of the new Dominion Energy location Thursday on 150 S. Jackson St., Lima. 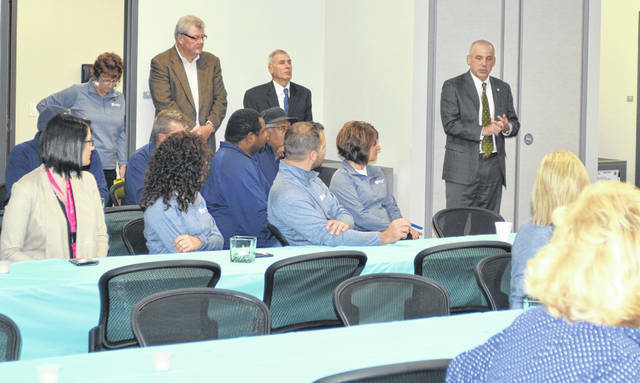 LIMA — Lima helped celebrate the opening Thursday of Dominion Energy’s new location on 150 S. Jackson St.
Dominion Energy welcomed members of the community for a grand opening and ribbon cutting. The new $15 million facility is a 14,000-square-foot administrative building and a 14,600-square-foot warehouse/fleet facility. The company has acquired three additional acres of land for parking. The former location was across the street, but shares the same address as the new facility. The new location is much more modern. Dominion Energy is one of the nation’s largest producers and transporters of energy and natural gas storage systems that serves more than 6 million utility and retail energy customers, according to Dominion Energy website. Lima Mayor David Berger said he is proud of the new expansion. Senator Matt Huffman, R-OH, who worked on the project, was also impressed by the work done by Dominion and the community.